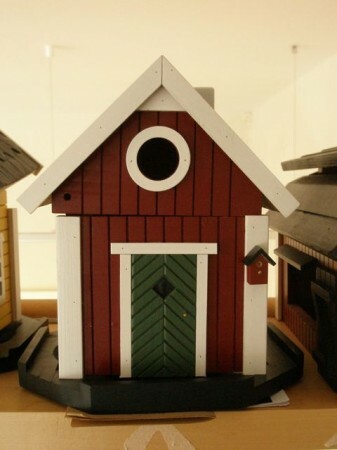 This is the story of how I happened to have a Swedish birdhouse right here in Long Beach, Washington. 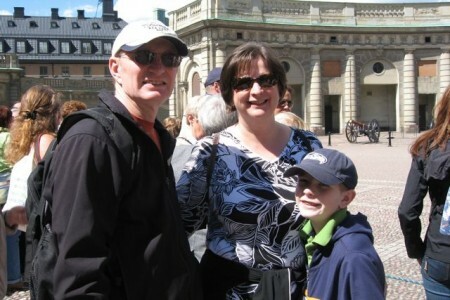 In 2008 Bob and I took a trip to Sweden with my sister’s family–Sally, Ray and Cole. 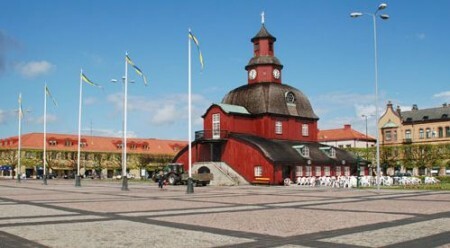 The charming town of Lidköping had shops all around the square. 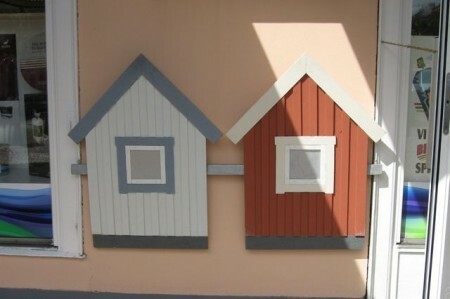 …and some had vertical wood siding. 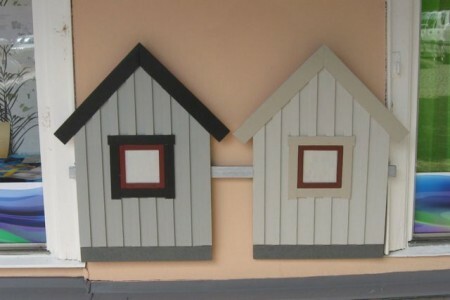 They even had different styles of window trim! 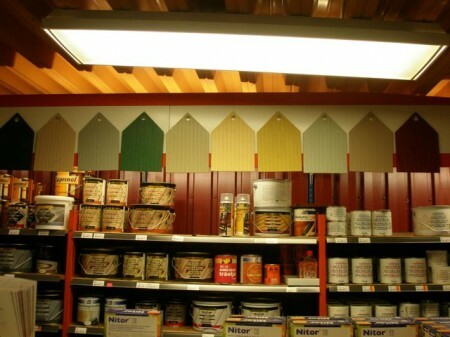 Inside, we were even more charmed by the paint swatches—more cottages! It made me want to paint something! 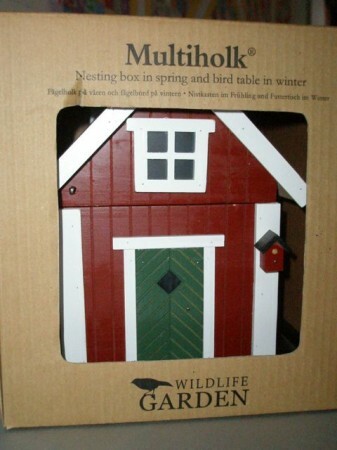 But then we saw the birdhouses! 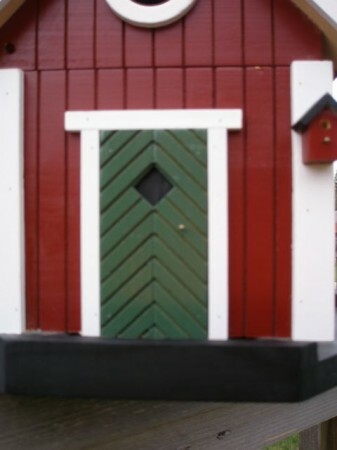 They were typical Swedish style cottages with amazing detail. 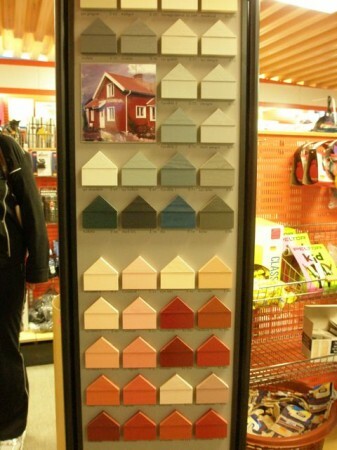 Most houses in Sweden are painted red, like this birdhouse. Some are painted a really pretty golden yellow, like this one. This is the back view, with the trellis. Have I said “charming” enough yet in this post? 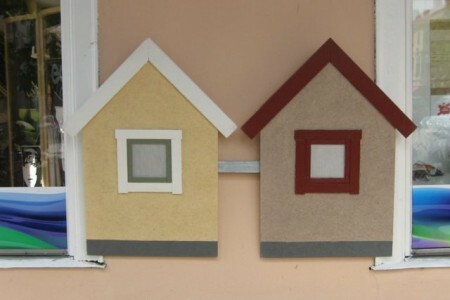 These birdhouses were definitely charming! I really, really wanted one, but how on earth would I get it home? 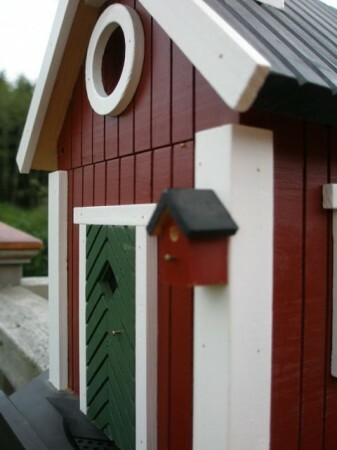 Alas, we had to leave the birdhouses there and all I had to remember them by were these photos. Now, fast forward to last weekend. Bob and I were in the cute (notice I didn’t say “charming,” although it would be appropriate here!) little town of LaConner, Washington. We went into a shop called Go Outside. 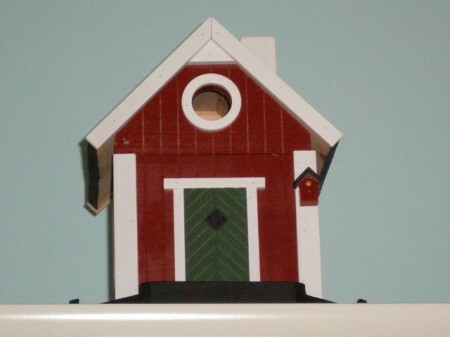 It had an eclectic mix of gardening items, books, stationery and more. 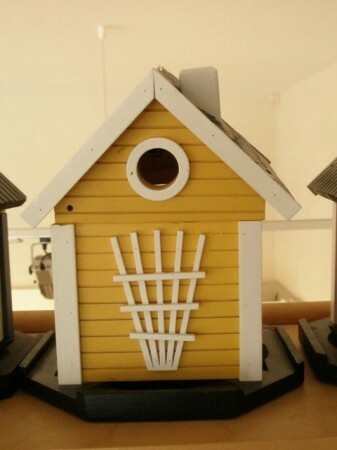 We wandered through, and were heading for the door when, up on a high shelf, I spotted…..drum roll, please……a Swedish bird house! 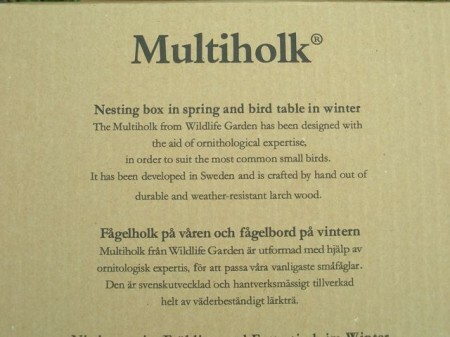 At first I didn’t really care about the box, but then when I saw the Swedish and English text on it, I was glad he had it. I’m not sure yet where we’re going to put it, but when we got home, I set it on the garden fence for a photo op. The attention to detail on this is amazing. 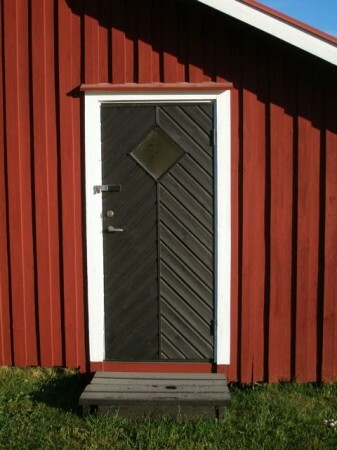 I’m crazy about the typical Swedish doors. I’m always taking pictures of them when I’m in Sweden. Like this one. 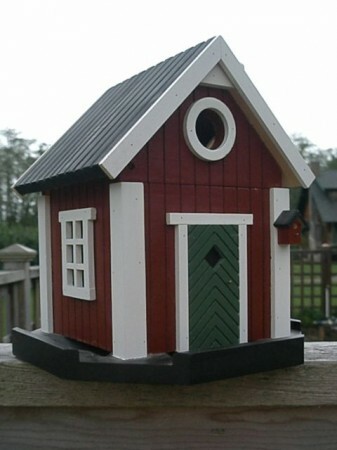 And here it is in miniature on the birdhouse! 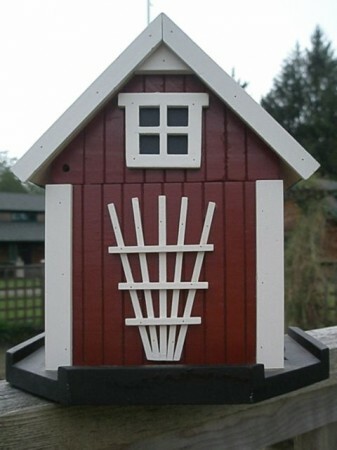 It has a chimney and white trimmed windows…. 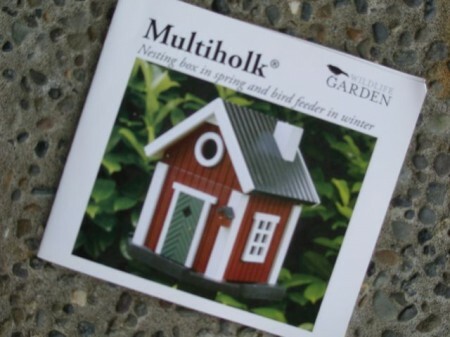 …and of course the trellis is on the back. 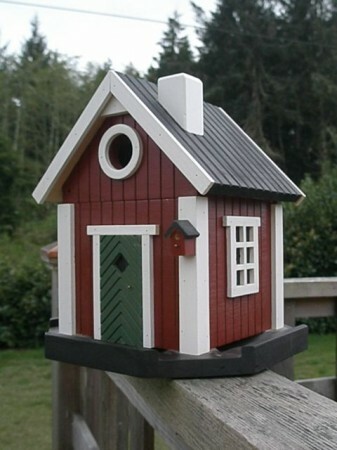 But I’m afraid I’m going to have to say “charming” again because I think the most charming thing about this birdhouse is that it has its own birdhouse on it! Can you tell I’m thrilled with my find?